IINGREDIENTS: NGREDIENTS: Brown Rice Syrup, ClifProâ„¢ (Soy Rice Crisps [Soy Protein Isolate, Rice Flour, Barley Malt Extract], Roasted Soybeans, Soy Flour), Rolled Oats (17.3%), Chocolate Chips (6.7%) (Dried Cane Syrup, Unsweetened Chocolate, Cocoa Butter, Emulsifier: Soy Lecithin, Vanilla Extract), Cane Syrup, ClifCrunchâ„¢ (Oat Fibre, Apple Fibre, Inulin [Chicory Extract], Milled Flaxseed, Psyllium), Date Paste, Soybean Paste (Roasted Soybeans, Soybean Oil, Salt), Sunflower Oil, Molasses Powder, Sea Salt, Flavourings, Cinnamon. VITAMINS & MINERALS: VITAMINS & MINERALS: Calcium Salts of Orthophosphoric Acid, Magnesium Oxide, L-Ascorbic Acid (Vit. C), Ferrous Fumarate, DL-Alpha Tocopheryl Acetate (Vit. E), Beta Carotene (Vit. A), Nicotinamide (Vit. B3), Riboflavin (Vit. B2), Thiamin Mononitrate (Vit. B1), Pyridoxine Hydrochloride (Vit. B6), Ergocalciferol (Vit. D2), Cyanocobalamin (Vit. B12). CONTAINS: OATS, BARLEY, AND SOY. MAY CONTAIN TRACES OF WHEAT, RYE, PEANUTS CONTAINS: OATS, BARLEY, AND SOY. MAY CONTAIN TRACES OF WHEAT, RYE, PEANUTS, MILK, AND TREE NUTS. Clif Bar is made with organic oats and soybeans. High in protein; no trans fats; 23 vitamins & minerals. Nutrition for sustained energy. Clif Bar supports organizations that address environmental, health and social issues. Clif Bar is named after my father, Clifford, my childhood hero and companion throughout the Sierra Nevada mountains. In 1990, I lived in a garage with my dog, skis, climbing gear, bicycle and two trumpets. The inspiration to create an energy bar occurred during a day-long, 175-mile ride with my buddy, Jay. We'd been gnawing on some other energy bars. Suddenly, despite my hunger, I couldn't take another bite. That's the moment I now call the epiphany. 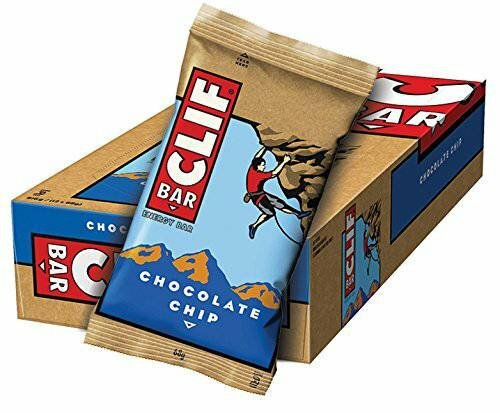 Two years later, after countless hours in Mom's kitchen, Clif Bar became a reality. And the mission to create a better-tasting energy bar was accomplished. Thanks, Mom! Clif Bar has grown since 1990, and still the spirit of adventure that began on that ride continues to thrive each day. As the company evolves, we face many choices, yet we always do our best to take care of our people, our community and our environment. - Gary, owner of Clif Bar. We source ingredients which do not contain wheat, dairy and are not genetically engineered. 70% Organic ingredients; certified organic by QAI. - Contains vitamins b6 and b12 which contibute to the normal release of energy for use in the body.